The president directed Transportation Secretary Ray La Hood and Environmental Protection Agency Administrator Lisa Jackson to draw up new rules that make heavy trucks much more fuel-efficient and produce less global warming gases. Three days later, Michigan Governor Jennifer Granholm was in Ypsilanti, midway between Detroit and Ann Arbor, to praise executives of the Ford Motor Company. Ford is spending $10 million to retool one plant in Rawsonville to assemble battery packs for next generation clean vehicles, and $125 million more in another plant in Sterling Heights to build electric drive transaxles. The $135 million investment, made possible by $62.7 million in federal clean vehicle grants from Obama’s 2009 stimulus act, will lead to 170 new jobs, said Ford, and bring work currently occurring in Mexico and Japan back to the United States. The two ceremonies, occurring 500 miles apart, are the latest public manifestations of a little recognized but exceptionally productive political partnership between the president and Michigan’s governor that is reshaping the American vehicle manufacturing sector, and starting to produce big consequences for energy use, climate action, and job production. Since Obama has taken office, Michigan has attracted roughly $6 billion in manufacturing investment focused on building batteries for electric vehicles. Last August, after the president announced that the Energy Department was awarding $2.4 billion in grants for battery development and manufacturing, Vice President Joe Biden personally travelled to the Detroit region to confirm that more than half, $1.3 billion, would be spent in Michigan and contribute to developing 19,000 new jobs. LG Chem, the Korean battery maker, received $151.4 million from the Department of Energy for the $303 million battery plant it is building in Holland, near the Lake Michigan shoreline. The plant will manufacture the power packs for the Chevy Volt, the plug-in hybrid that General Motors says it will introduce later this year. The LG Chem plant opens in 2012 and is expected to employ 400 people. Johnson Controls received a $299.2 million federal grant to make nickel-cobalt-metal battery cells and packs, as well as produce battery separators in a plant it also is building in Holland, Michigan in a joint venture with Saft, the French battery maker. The project is expected to employ 550 people by 2014. In all 17 new battery plants are either under construction or nearing groundbreaking in Michigan, according to the Michigan Economic Development Corporation, a state agency. Toda America, a Japanese manufacturer of battery components, broke ground in Battle Creek in April for a $70 million plant that will initially employ 60 people. A123 Systems, an innovator of battery technology incubated at the Massachusetts Institute of Technology, is building two plants just outside Detroit. It’s understandable that Granholm and auto industry executives are enthusiastic about the state’s embrace of clean car technology. They also support, after decades of resistance, the new efficiency and emissions reduction rules. The regulatory standards have the effect of producing new markets and force vehicle manufacturers to modernize their thinking to compete. The convergence of new technology, new regulation, and big federal and state investments has produced several thousand new jobs announced to date. Each is viewed as precious in a state overwhelmed by the downsizing of the auto industry and a riptide of manufacturing job losses over the last decade. In Washtenaw County, where Ford’s Rawsonville plant is located, 14,000 manufacturing jobs disappeared since 2001, according to county figures. The state has lost a total of 800,000 jobs since 2000, half of them in manufacturing according to the Bureau of Labor Statistics. Michigan has led the nation since the middle part of the last decade in the rate of joblessness, which currently measures 14 percent, but also is improving since it’s high of more than 15 percent late last year. Indeed, at times in her public appearances, Granholm appears almost giddy about the germination stages of what could be a new era of vehicle design and production in Michigan. First are the market analyses that consistently predict big domestic and global markets for clean vehicles. In 2009, Deutsche Bank estimated that global sales of electric, hybrid, and other alternative fuel and advance technology vehicles stood at 1 million and could rise to 1.3 million this year, a 30 percent increase. J.D. Power and Associates recently estimated that sales of hybrid-electric vehicles could reach about 1.3 percent of an estimated 67 million light vehicle sales worldwide this year. DTT Global Manufacturing Industry group estimates that by 2020, electric vehicles and other “green” cars will represent up to a third of total global sales in developed markets and up to 20 percent in urban areas of emerging markets. “The drive for e-mobility is on the rise and not only affects the automotive industry, but also other related industries such as energy & resources,” Martin Hoelz, Deloitte Germany partner and Global Automotive Affinity Group Leader for DTT Global Manufacturing Industry group, said in a news release. Ford alone plans to launch five new all-electric or hybrid gasoline-electric vehicles in the U.S. by 2012 and in Europe by 2013. One is an electric commercial van, the Transit Connect. Two others are plug-in hybid electric sedans. The second reason for Granholm’s fervor about clean vehicles is the daring new clean energy and climate policies that the Obama administration is steadily delivering to support them. She has personally played a big role in that delivery system. Following her 2006 re-election on a promise to produce new jobs, the two-term Democrat seized on clean energy to leverage Michigan’s heavy manufacturing prowess. Michigan approved a renewable energy standard that required utilities to generate 10 percent of their power with clean sources by 2015. It established a 21st century jobs fund that provided millions for job growth, a good share focused on attracting clean energy development. And it set aside $1 billion for tax incentives to lure battery makers. In 2008, candidate Obama campaigned on a message that envisioned a transition to the low-carbon economy that would wake up American industrial innovation, generate jobs, make the nation more secure, and reduce the threat from climate change. He introduced his New Energy For America strategy in August 2008 in East Lansing, Michigan, a state that embraced the same ideas and had a governor who could deliver the votes to help send him to Washington. Their relationship, at least in public, seems genuinely warm. Granholm is routinely on the White House list of candidates for the Supreme Court. 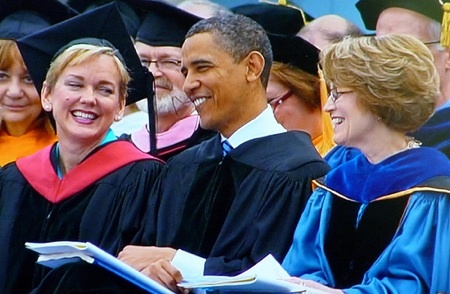 Obama is a regular visitor to Michigan, appearing with Granholm most recently on May 1 (see pix with University of Michigan President Mary Sue Coleman on right) to deliver the commencement in front of 90,000 people at the University of Michigan, the largest crowd the president has addressed since the Inauguration. The partnership, in policy terms, has been substantive in ways little noted in Washington or the nation. The Obama administration has passed legislation and administrative rules to support the development of a clean vehicle manufacturing sector that Granholm is determined to base in Michigan. The 2009 American Recovery and Reinvestment Act contained over $3 billion for clean vehicle development including $2 billion for battery development, and $1.3 billion for electric and alternative fueled vehicles. Energy Secretary Steven Chu has sent Michigan substantial funds from a $25 billion clean vehicle manufacturing account approved late in the Bush administration. The Obama administration also has supervised the $50 billion investment that taxpayers made to keep GM and Chrysler in business, making it much easier to direct the companies to pursue new product lines since the U.S. essentially owns both. The president and his advisors, lastly, are ordering up the administrative rules to ensure that the next generation of vehicles do more with less. A year ago, Obama directed Secretary LaHood and Administrator Jackson to develop rules for improving fuel mileage and reducing greenhouse gas emissions in light cars and trucks beginning with the 2012 model year. The government issued the rules on April 1 and the EPA estimated the new standards would save 1.8 billion barrels of oil from 2012 to 2016, and reduce greenhouse gas emissions by 900 million metric tons. Both are significant. The annual fuel savings, nearly 400 million barrels, represent roughly 7 percent of all the oil used in America in 2006, according to the World Bank. The emissions reductions, roughly 180 million tons annually, represent over 3 percent of all carbon emissions the U.S. produced in 2006. Last year in Copenhagen and elsewhere, the administration said it wanted to cut greenhouse gas emissions 17 percent from 2005 levels by 2020. The clean vehicle rules will help the U.S. reach that goal. The new heavy truck rules that Obama ordered last week should also produce substantial fuel and emissions savings. Heavy trucks, according to industry analysts, consume more than two million barrels a day, or about 12 percent of current daily use in the United States, and produce a fifth of greenhouse gas emissions related to transportation. “America has the opportunity to lead the world in the development of a new generation of clean cars and trucks through innovative technologies and manufacturing that will spur economic growth and create high-quality domestic jobs, enhance our energy security, and improve our environment,” the president said in a memorandum accompanying the May 21 Rose Garden ceremony. That message has reached deep into Michigan’s reviving vehicle manufacturing sector. Lenawee Stamping, a producer of metal stamping and welded fabrications is expanding a plant in Tecumseh to accommodate more production of GM’s clean electric vehicles and produce almost 140 jobs. Magna Holdings of America, a designer and manufacturer of automotive components and systems plans to invest $49.2 million to expand its operations in four Michigan cities to produce electric car systems and 500 more jobs, according to the Michigan Economic Development Corporation. Tenneco Automotive, which makes emission and ride control products, is spending $15.6 million in Michigan to manufacture next generation emissions systems that help manufacturers comply with the new federal rules and generate 185 new jobs.